Recently we’ve had several patients who have had issues with chronic ear infections in their kids’ ears and have asked questions. Q: My 7 year old daughter has an ear infection. She does not have a fever; however, she does have redness and some white cloudiness behind the ear drum. She has tubes as well. I know that adjustments help but is there anything you can suggest for me to help with this? Her ENT usually just prescribes an antibiotic; however, I obviously would like to stay away from this. A: A little explanation of the anatomy: The Eustachian tube, or pharyngotympanic tube, originates in the rear of the nose adjacent to the soft palate, runs a slightly uphill course, and ends in the middle ear space. It is lined by a mucous membrane like that of the nasopharynx (nose and throat.) It functions to equalize pressure in the middle ear with the atmospheric pressure, thereby allowing free movement of the tympanic membrane. The secondary function of the Eustachian tube is to drain any accumulated secretions, infection, or debris from the middle ear space. Small muscles in the back of the throat help to open and close the Eustachian tube by swallowing and yawning. 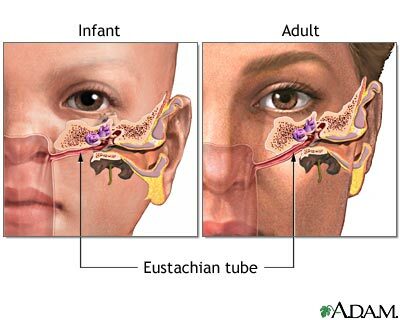 The Eustachian tube in children/infants is horizontal compared to that of an adult, and also narrower in diameter. What does this mean? It isn’t able to drain as efficiently. Fluid and debris can back up in the middle ear and become infected, called Otitis Media. This is often secondary to an upper respiratory infection (cold, sinus infection, or allergies) due to inflammation and swelling of the mucous membrane lining the tympanic cavity. Enlarged adenoids obstructing the opening of the Eustachian tube may also be present. Echinacea: Find a children's version at your health food store and take as recommended on the bottle. Watch out for hidden artificial colors and sweeteners. If she can swallow pills, I would do 1/day. Zinc Lozenges: Take 1-2, 15mg zinc lozenges for a few days. Watch out for hidden artificial colors and sweeteners...or use the one we offer. Q: What is your opinion of Glucerna, the over the counter diabetic drink? It can lower blood sugar but in the morning blood sugar is up again. Is it causing harm in the long term? Water, Corn Maltodextrin, Milk Protein Concentrate, Fructose, Glycerol, Short-Chain Fructooligosaccharides, Cocoa Powder (Processed with Alkali), Soy Protein Isolate, High Oleic Safflower Oil. Less than 2% of the Following: Canola Oil, Soy Oil, Cellulose Gel, Potassium Citrate, Magnesium Phosphate, Salt, Choline Chloride, Ascorbic Acid, Calcium Carbonate, Calcium Phosphate, Sodium Citrate, Cellulose Gum, Potassium Phosphate, Natural & Artificial Flavor, Potassium Chloride, Monoglycerides, Soy Lecithin, Liquid Sucralose, Potassium Hydroxide, Magnesium Chloride, Carrageenan, Turmeric Concentrate, Acesulfame Potassium, Ferrous Sulfate, Zinc Sulfate, dl-Alpha-Tocopheryl Acetate, Niacinamide, Manganese Sulfate, Calcium Pantothenate, FD&C Red #3, Cupric Sulfate, Vitamin A Palmitate, Folic Acid, Thiamine Chloride Hydrochloride, Riboflavin, Chromium Chloride, Pyridoxine Hydrochloride, Biotin, Sodium Molybdate, Potassium Iodide, Sodium Selenate, Phylloquinone, Cyanocobalamin, and Vitamin D3. Synthetic Vitamin E, couple of artificial sweeteners, dairy/soy, artificial colors…I would never recommend this to a patient. It is important to know that just because it is available/popular, it doesn’t mean that it is wise and/or good for you.